Green - the colour represents richness, freshness and strength, which is very true if we look at the nutritional profile of green leafy vegetables (GLV). They are rich in nutrients like carotene, a good source of calcium, folic acid, vitamin B2 and vitamin C, oh and not to forget about fibre! All these nutrients help us to stay fresh all day long, they give us strength, and so these vegetables are a must in our diet. 1. You can make sabzi, either with greens only, or in combination with some other vegetables. 2. Make green paratha, thepla, roti, dosa, idli. Add garlic paste to enhance the taste. 3. Make a variety of soups with greens. 4. Add the greens in salads. 5. Garnish the continental dishes with greens. 6. Garnish the traditional dishes with coriander, spring onions greens or pudina- it will add freshness to the recipes. 7. Make green rice with spinach, pudina, methi, coriander. Serve it with a raita or curd. 8. Make chutney and have it dosa, idli, paratha, roti, etc. 9. Add raw fresh greens to sandwiches. 10. Spinach can be used to prepare green gravy. 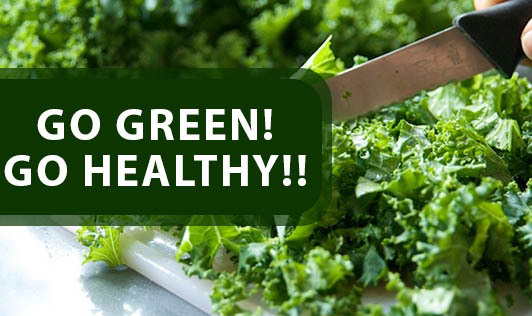 By going Green, you go Healthy! !